For the natural look they bring to a home, wood roofs are unbeatable. However, in other aspects, they also need a lot of work to keep them looking attractive and working correctly. Wood has lost its popularity in recent years due to the fire hazard it posed, but the good news is that wooden shingles are now sprayed with fire retardant before installation to prevent fires. Eclat Roofing provides the best services for Dallas, TX wood roofs. We want your roof to last as long as possible, which is why we provide quality installation, repair, and maintenance services in the DFW area. The good news about wood roofs is how much homeowners can customize them. From cedar to redwood to cypress and more, you can pick the wood you like based on its color, grain or other qualities. Then, you can also decide whether you want shingles or shakes. Shingles have a smoother appearance since they are sawn. Shakes provide a rustic look since they’re made by splitting logs. 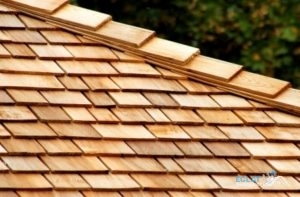 Another advantage of wood roof installation is how light the shingles and shakes are. Unlike clay and concrete tiles, they are extremely light, which means any home’s structure can hold them up. We are the best choice for wood roof installations and replacements! Read our reviews from satisfied customers and ask us for references from previous jobs. You won’t be disappointed with our work record! Regular maintenance is required of Dallas, TX wood roofs. They will need to be sprayed with a fire retardant every couple of years to keep them from becoming a hazard. They will also need regular inspections to assure that no shingles or shakes have sustained warping due to water damage. Since wood shingles are also susceptible to moss and algae growth, the wood will have to be treated for these as well. We are also an excellent choice for wood roof repairs, getting them done right the first time in a timely manner. We know that wood roofs last longer with prompt repairs, which is why we will always fix them the right way and never cut corners. Eclat Roofing has over 15 years of experience working with Dallas, TX wood roofs. Our roofers are knowledgeable and helpful to bring you the very best residential roofing services in the area! Not only do we serve the DFW area, we can also travel to locations across Texas, Louisiana, and Oklahoma! Call us today at (214) 373-1500 for your wood roof service! Updated on September 13, 2018 at 3:18 pm by Eclat Roofing.